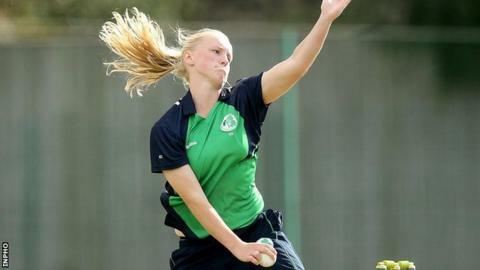 Kim Garth starred with bat and ball as Ireland started the Women's World Cup Qualifier with a comfortable 119-run win over Zimbabwe in Sri Lanka. Ireland rattled up 237-6 in their 50 overs with Garth top-scoring on 63 while Laura Delaney added 47. Garth also boasted the best bowling figures of 3-24 as Zimbabwe were skittled out for 118 in 37.5 overs. Ireland, who take on the hosts on Wednesday, need a top-four finish in the qualifiers to make the World Cup. The Irish lost a warm-up game against Bangladesh on Sunday but they were back in top form in the Group A opener in Colombo. An impressive third-wicket partnership of 94 between Garth and Delany laid the foundation for Ireland's healthy total. Clare Shillington (30) and Cecelia Joyce (26) also added valuable runs at the Mercantile Cricket Association Ground. Zimbabwe struggled in reply with Ashley Ndiraya hitting 35 but only three other players reached double figures. Garth led Ireland's fine bowling display while Ciara Metcalfe (3-38), Robyn Lewis (2-7) and Amy Kenealy were the other wicket-takers. "It's just great to start off with a win," said Pembroke all-rounder Garth. "Zimbabwe bowled and fielded well and we did a good job to post that total in these conditions. "We were clinical with the ball and will take confidence from that into Wednesday's game against the hosts." In Tuesday's other Group A game, Sri Lanka beat India by 114 runs, while in Group B, South Africa beat Pakistan while Bangladesh overcame Papua New Guinea. Ireland will play tournament favourites India on Friday before completing their group games against Thailand a day later. The top three in Group A go through to the Super Six, and from this the top four secure a place in the eight-team World Cup in England from 24 June to 23 July. All matches played in Colombo & start at 04:30 GMT. CCC = Colombo Cricket Club; MCA = Mercantile Cricket Association Ground; NCC = Nondescripts Cricket Club.